Ba chóir an t-alt seo a ghlanadh, mar: Dhá "é" in aon abairt amháin. "Ceann" in áit "duine": one of things = ceann de na rudaí, but one of people = duine de na daoine. "De" is not one to one equivalent to English "of", and especially not when "of" is genitive in function: "san 19ú haois" is preferable. "Clann" does not mean "family", but "the children of a particular couple". After "áit" in the sense of "(the place) where (something happened), use always an indirect relative clause. In standard Irish, use always eclipsis in singular after chuig + definite article. Sa is the same as i + an and cannot be followed by another an. Roinnt is followed by plural. 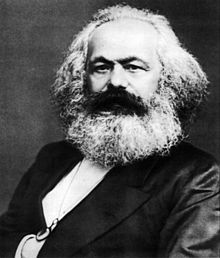 Duine de na fealsúna ba thábhachtaí sa 19ú haois ab ea Karl Marx (Trier, 5 Bealtaine, 1818 - Londain, 14 Márta 1883). Rugadh é i dTrier in aice leis an abhainn Moselle do dhaoine meánaicmeach Giúdach. D'fhreastal sé ar dtús ar dámh an dlí in ollscoil Bonn ach chuir a athair é chuig ollscoil Bheirlín, áit ar fhan sé ar feadh ceithre bliana. Thóg sé post mar eagarthóir sa nuachtán an Rheinische Zeitung, foilseachán liobrálach. Tháinig sé go Páras ag deireadh 1843, áit ar bhuail sé le Friedrich Engels. Cuireadh amach as Páras iad agus bhog siad chuig an Bhruiséil i 1844. Scríobh siad a gcuid smaointe sa bhForógra Cummannach agus díreach tar éis a fhoilsiú ar deireadh na bliana 1847, thosaigh roinnt réabhlóidí ar fud na hEorpa. Tar éis seal eile sa Ghearmáin mar eagarthóir ar nuachtán eile a cuireadh faoi chois, an Neue Rheinische Zeitung, chuaigh Marx go Londain mar deoraí polaitiúil i mBealtaine 1849 nuair a choisc an rialtas an foilseachán agus chónaigh sé ansin go lá a bháis i 1883.